I receive a hell of a lot of review requests, and manage to fulfil less than I ought and much less than the bands in question deserve. This is a happy exception; an online-only split release from Withering Light, my requesters, and Louisiana-based noisemongers Barghest whose second full-length The Virtuous Purge was ably reviewed by my colleague Charles earlier this year. Yet it's Withering Light that I want to focus on here, impressing me more with their contribution on this release. Perhaps it's a matter of mood, perhaps just because they have two tracks out of three on the split! Yet there's enough raw talent on show to make me wish for a full-length from them, as soon as possible, for a full revelation as to their musical powers. Opening the split with Lantern, Withering Light impress from the start with a track that is ostensibly black metal, but which is too shapeless and experimental to be so easily pigeonholed. With riffs that are initially more like extended noises and a backing percussion that is a formless rumble, the song takes shape as it progresses, growing more melodic and closer to something like modern USBM. It's too raw to really be melodic, but the hints of melody are there, and of something growing behind the murk... very interesting. Barghest follow with Carrion, a blast of noisy and raw black metal that is very close to what Charles described as 'a belch from the mouth of a corpulent sewer fiend'. This is a very nasty, very strange combination of black metal and sludge that uses melody as drips of relief, and makes you work for it. A darkly brilliant band – their album The Virtuous Purge is highly recommended, if you want more of the same. 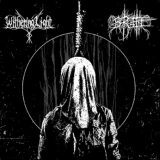 Withering Light take the lead again for the split's final track, Noose Hymn, a heavier and even darker piece than their first track, more focused on the snarled vocals but with a weirdly more progressive feel. Riffs are more pronounced and there's even something like a breakdown early in the eight-minute song's running time, after which it slows and develops the sludge elements, before speeding back to black metal territory. An interesting track, if one that feels like it's combining lots of ideas – as mentioned, a full-length would be fascinating to see how they develop. I sincerely hope Withering Light are able to produce an album – a name to remember, in the meantime, and a glimpse of possible emerging genius. Listen and buy via the Bandcamp link above.